Midwest Motion Products knows their market has a need for right angle planetary gearmotor assemblies. They had the perfect motor and the planetary gearmotor, but finding the right angle gearbox, positioned between the two, designed to their specifications was the challenge. Designed for a wide variety of power transmission and motion control applications where right angle motion is needed, our right angle gearboxes are low cost and durable. 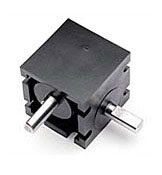 Utilizing a strong, glass-reinforced, injection molded nylon housing, our right angle gear box options also make use of a standard carbon steel shaft for long-life and durability. Midwest Motion Products designs, manufactures, and distributes standard and custom motion control equipment, including fully reversible brushed and brushless DC gearmotors, motors with failsafe brakes and servomotors with feedback devices such as analog tachometers and encoders. More about MMP Inc. / MIDWEST MOTION PRODUCTS, INC.